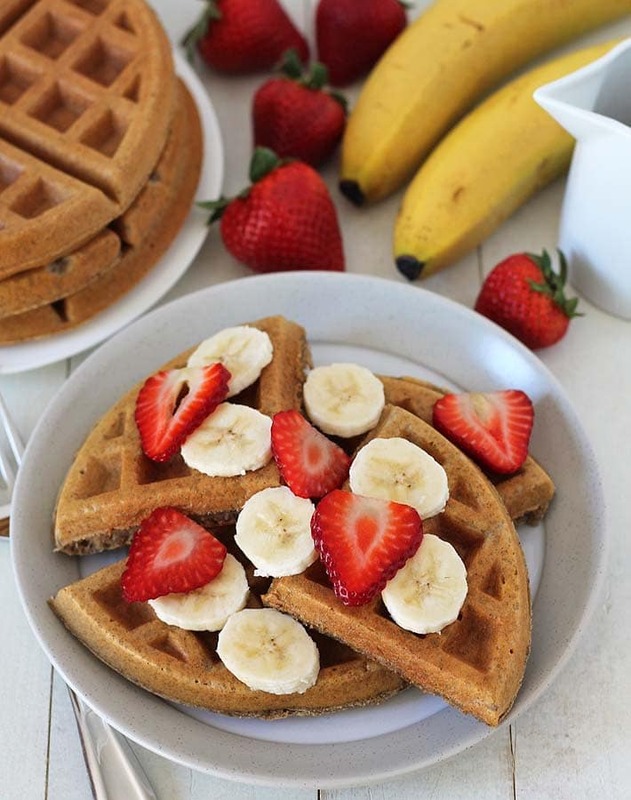 Spiced vegan banana waffles that are crispy on the outside but soft and fluffy on the inside. This delicious gluten-free vegan breakfast will become a new favourite morning treat in your home! Before we start talking about these waffles, let’s talk about that waffle maker you’ve been thinking about buying but haven’t done it yet because you don’t think you’ll use it much. I was in the same boat as you for a while, but then I gave in, and I haven’t looked back. Mine gets lots of use and I don’t regret buying it, at all. Gather a little collection of waffle recipes, make them all, find your favourites, and put your waffle maker to work. You’ll have no regrets buying it. This is the one I bought, it’s inexpensive, compact, and works great. For these banana waffles, I went back to my vegan banana pancakes recipe, adjusted it slightly, and this recipe was the result. 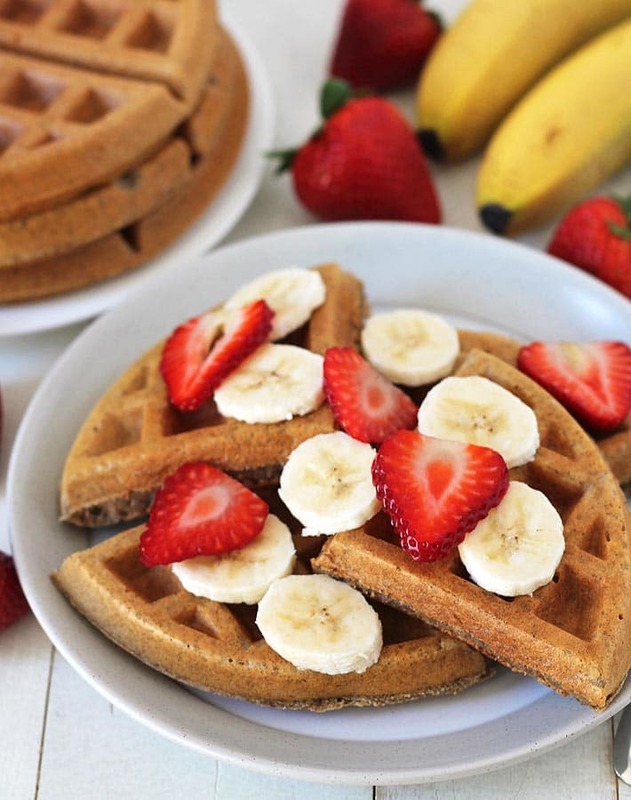 Top your waffles any way you like, for these, I like to top with whatever berries are available and sliced bananas, as shown in the pictures. And real maple syrup, of course. Other options you can go with are coconut whipped cream, maple caramel sauce, fruit syrups, even chocolate syrup…it all depends on what you like best! And like all of my other waffle recipes, these are crispy on the outside and fluffy on the inside. See the picture below. 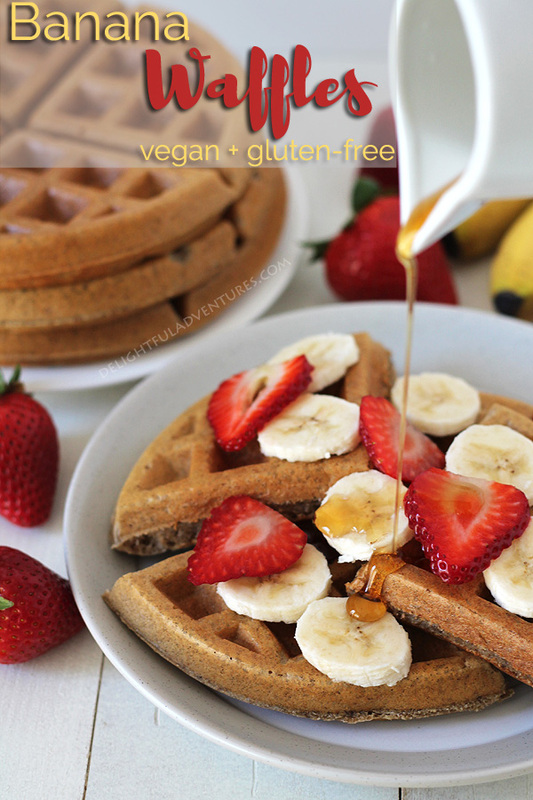 When some people hear they’re about to be served a dish that’s vegan or gluten-free or vegan AND gluten-free, they seem to think they should expect something strange-tasting or something with a texture similar to cardboard (*eye-roll*), but these waffles are anything but. If you have someone you’re serving who thinks that way, they’ll devour these and have no idea that they just had gluten free vegan banana waffles. Will mashed bananas work for this recipe? 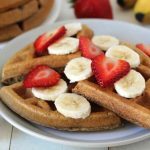 I don’t like banana chunks in my banana breads, waffles, or pancakes, so any time I use bananas in these recipe, I always purée them with a hand blender (a blender or food processor can also be used), until they are smooth and like liquid. 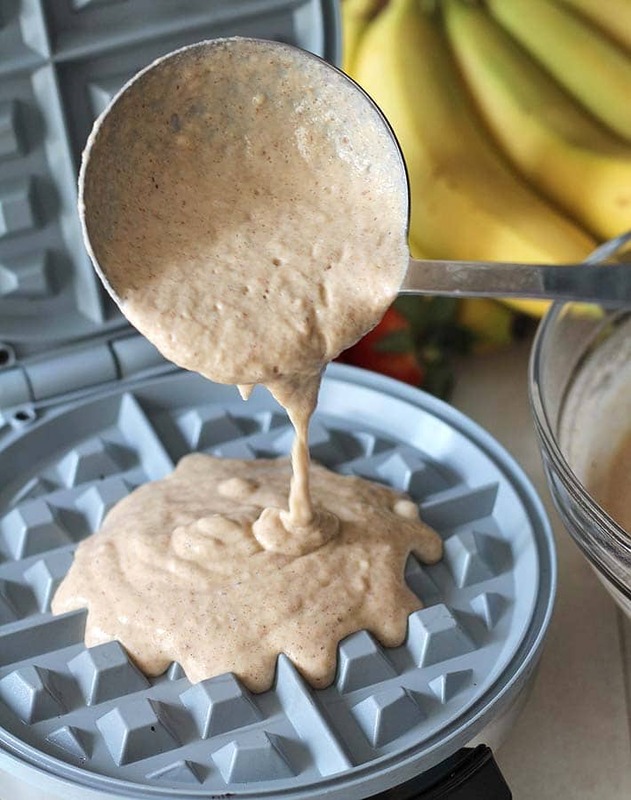 Because the bananas in this recipe are puréed, they also serve as a liquid in the recipe, so be sure that you either puree or mash as best you can so no chunks remain in order for the batter to not be too thick. Can I use a different flour for this recipe? I have not tested with any flour other than the gluten-free blend I link to below. I can tell you that coconut flour WILL NOT work in this recipe. Wheat flour will work but I have not tested the ratios yet, so it may not be a 1:1 replacement. 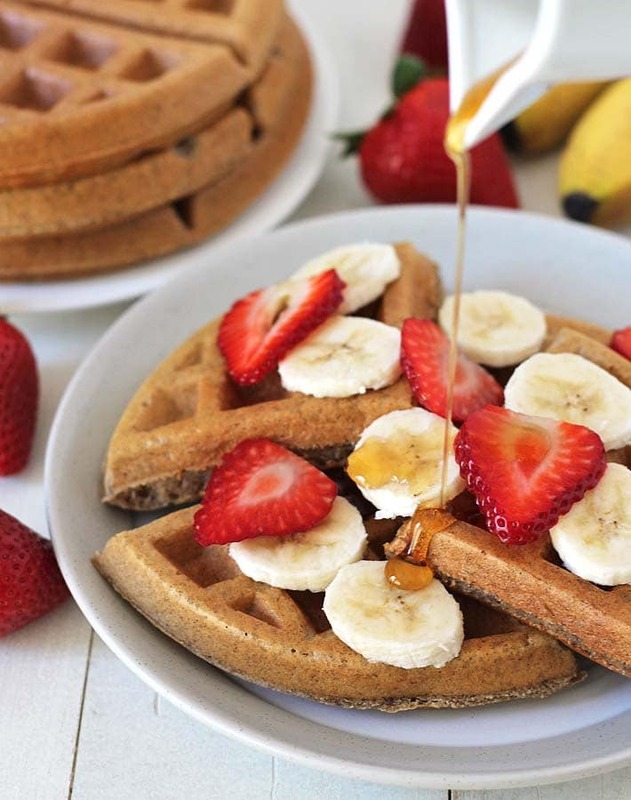 Spiced vegan banana waffles that are crispy on the outside but soft and fluffy on the inside. This delicious gluten-free vegan breakfast will become a new favourite breakfast treat in your home! Turn oven on to "warm" setting or to 200F to keep your finished waffles warm and crispy (see link to directions for this tip above). Whisk almond milk, coconut oil, vanilla, ground flax seeds, maple syrup, and banana puree together in a medium-sized bowl, whisking enough to incorporate the flax seeds. Let sit for 5-minutes. 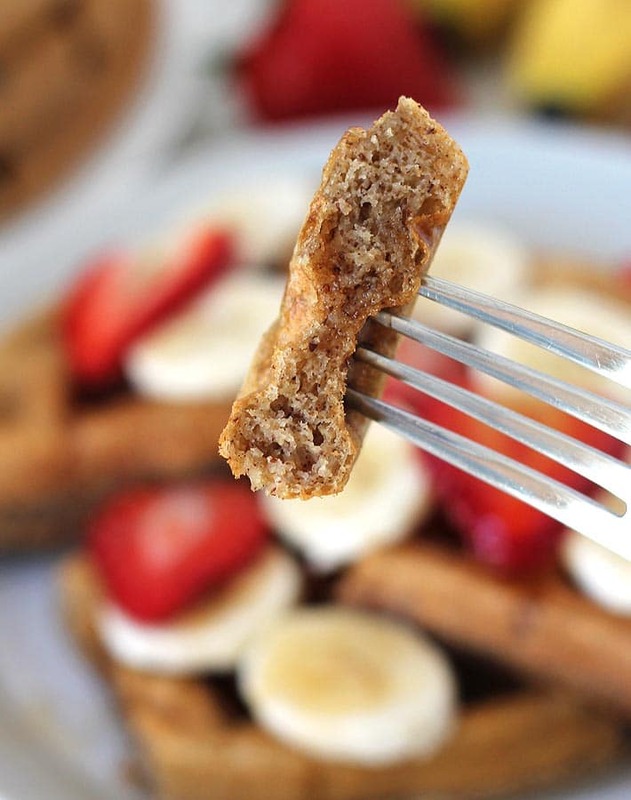 This recipe makes four standard sized round waffles. These waffles freeze very well. Simply cool the waffles after they have been made, cut into quarters, and freeze. 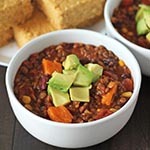 When ready, heat in your toaster, oven, or toaster oven. It's important to know that different gluten-free flour blends use different ingredients and ratios, so results will always vary when you use different blends. 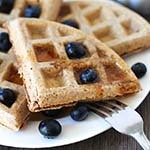 I have never used any other brand of flour to make these waffles (other than Bob's Red Mill), so please know that your results may not be the same as mine if ingredients are substituted. Coconut flour will NOT work for this recipe. 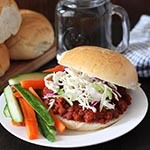 The bananas for this recipe must be very ripe or overripe, make sure they have brown spots and are soft. I purée my bananas until they are smooth, no chunks. Nutrition info listed below is based on one waffle without any garnishes or syrup. Nutrition info is only to be used as a rough guide. Click here to learn how nutrition info is calculated on this website. Hello Gwen, I made your banana waffles for our big family Thanksgiving morning breakfast yesterday and they were loved by everyone. I am vegan and I have a two nieces who have to eat gluten-free and they loved them too. Thank you for this recipe, I’m going to look around at all of your other recipes. I’m very happy to hear you and your family like the waffles, Linda! I hope you like the other recipes just as much and if you have any questions about them, please feel free to get in touch 🙂 Thanks so much for your note!